To listen to more full-length programs online, you can download the mp3 versions in our resource area. 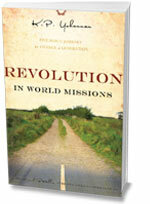 Download Revolution In World Missions in its entirety in MP3 format, for free. In this exciting and fast-moving narrative, Dr. K.P. Yohannan, Metropolitan shares how God brought him from his remote Indian village to become the founder of GFA World. Each day, followers of Christ are called to die to themselves and their flesh. The Road to Reality asks people to seek a deeper walk with Christ, to live a life wholly centered on Him and to reach out to those who are lost. Hundreds of radio stations across the nation air Dr. K.P. Yohannan, Metropolitan's thought-provoking Road to Reality messages on how to die to yourself daily, live for Christ and develop a passion to reach the lost and dying. Visit roadtoreality.org to see if your local station airs Road to Reality.